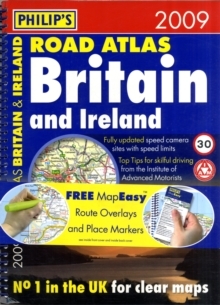 "Philip's Road Atlas Britain and Ireland 2009" provides the increased level of information demanded by the many drivers travelling occasionally to Ireland. The whole island is covered across seven pages - far more than any competitive atlas - and is fully indexed. There are indexed town plans of Dublin, Cork, Belfast and Londonderry. The 176 pages of road maps cover Britain at 3 miles to 1 inch (Western Isles, Orkney and Shetland at 4.75 miles to 1 inch).The maps clearly mark service areas, roundabouts and multi-level junctions, and in rural areas distinguish between roads over and under 4 metres wide - a boon for drivers of wide vehicles. Across the Channel, a full-page map shows Calais and Boulogne, and a double-page map shows the full extent of the northern French coast including all ferry ports. The atlas also includes route-planning maps, M25 and M60 maps, full listings of mobile speed-camera sites, distance table, 12 large-scale city approach maps with named arterial roads, and 97 extra-detailed town and city plans, airport plans and port plans.